At our initial meeting I take the time to learn about your goals and constraints. I go over each step of this very process and inform you of what to expect along the way. We craft a home-buying strategy custom-built for your needs. Next I go over my responsibilities to you as a licensed agent. Finally, I answer any and all questions you may have. The benefit to you is that you will walk away informed and prepared. Unless you’re a cash buyer, sellers want to see a pre-approval letter from a lender before taking your offers seriously. And since the lender has the final word in the price range of your home, we can’t really put your search into high gear until you reach this milestone. Need a lender who will offer great rates and service? I can point you in the right direction. I highly recommend working with a lender as early as possible. You’ll know exactly how much home you can afford, and what steps you could take to improve your profile as a borrower. Read about the 3 Financial Steps You Must Take Before Shopping for a Home. Picking the right lender is critical to your sanity during the deal. A lender who can’t meet their commitments may not be worth the few bucks you save on fees. This is the best part! Together, we look behind the locked doors of Seattle. There will be many beautiful homes and many surprises. I guarantee at least a few laughs along the way and plenty of neat finds. That said, I make a point to preview many of the homes I show so you don’t waste your time on listings that look great on paper but terrible in real life. Now that you found a home you really love and you can see yourself living there, it is time to take action. But first we’re going to do a little homework. I’m going to research recent market activity to help you determine a fair opening offer so you neither overpay nor lose the deal. We will also look into city and county records for signs of trouble and double check land use restrictions. Then we work on a negotiation strategy before things get emotional because the last thing you want to do is to make spontaneous decisions. Finally I will guide you through the 20 page legal document known as the Purchase and Sale Agreement in a way that makes it easy to understand. Your offer is signed and delivered to the buyer. The seller can either accept your offer, decline it outright, or counter with a different offer. Not to worry though. We’ve already discussed our battle plan, and now I do my part to get you the best possible outcome. The seller accepts your offer. 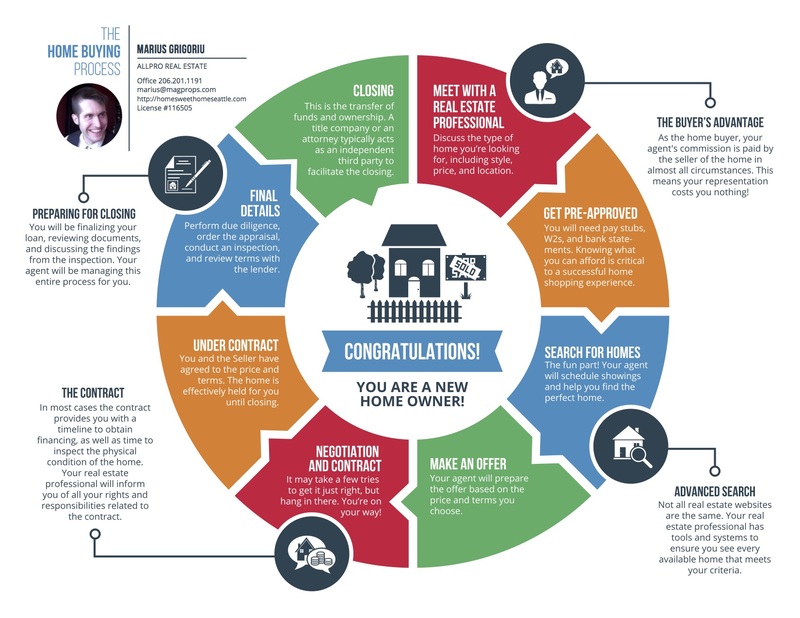 This is a major milestone on your home buying journey! You are now legally required to take the action spelled out in the contract to buy the home. Similarly, the seller is legally obligated to sell you the home if you meet your end of the bargain. Time is of the essence! The remainder of the journey is a race against the clock to close the deal. Cash buyers need not apply. Everyone else needs to make sure they get their lender started on the loan application and underwriting process immediately. The loan application and underwriting process is the critical path. All of the lenders I recommend have a track record of performing, but you can trip them up if you are slow to respond to their questions. Do not delay! Hazard insurance, also known as homeowner’s insurance, is required by your lender and protects you from many major disasters. Don’t wait until the last minute to shop for a policy. Start right after you’ve filled out your loan application. Earnest money is a deposit that assures the seller you mean business. You only have a short time to deliver the earnest money after reaching an agreement before the seller moves on to work with another buyer. Failure to perform according to the contract will result in a loss of your earnest money. There’s nothing to worry though! You will have plenty of opportunities to get it back if the deal sours, but only if you follow the rules, and you’ve got my support to keep you in the clear. I strongly urge you to get an inspection whether you’re buying any home old or new construction. Inspections come in many varieties: general inspection, sewer scope, pest inspection, asbestos survey, structural inspection, title inspection, and so on. I will help you decide evaluate the risks involved and which inspections and research you will want to conduct. Depending on what we learn, we can continue with the purchase as originally planned, ask for repairs or other concessions, or walk away and get your earnest money back. Lenders require an appraisal to protect themselves against lending more than the home is worth. Appraisers also check for basic safety requirements which are required to be met before you can close on the property. Lenders tend to wait for you to approve the inspection before ordering an appraisal so I will keep the lender informed of our progress throughout the process. Sometimes a home will not appraise. It can happen in a fast-moving market where there is disagreement on home values. This is where I step in to persuade the seller to lower their purchase price or persuade the lender that our offer does indeed reflect market value. Has the seller completed the repairs you requested in your inspection response? Has a new leak developed between the time you toured the home and the time you’re closing? Has the property turned into a smoking crater? We’re going to take one last walkthrough to ensure you’re paying for the same home you saw when we made the offer. Get ready to sign a mountain of documents. If you’re the type that likes to read every word, I recommend reviewing the documents ahead of the signing appointment. Most of these documents are the terms of the loan and numerous disclosures lenders are required to make. In the event you’re traveling or unable to attend the appointment, we can usually dispatch a mobile notary to meet you at your location. The last step is to fund the deal. Your lender will take care of funding most of it, but you’ll need to bring the remainder of your down payment plus any closing costs you still owe. You can choose between paying with a bank check or wire transfer. Personal checks are a big no-no. Once all previous steps are complete, the lender will wire in funds, and escrow will pay off all parties and record the deal with the county. I will arrange to deliver you the keys. Congratulations! You are a new home owner! Not your ordinary real estate agent. I have a long history in tech, and I invest my own capital; buying, fixing, and selling my own homes. I realized, after signing many real estate contracts, that I could share my experience with others. I ignore the high pressure playbook that other agents use and instead pay attention to my clients.